What's the Best 2018 Ford Edge Trim Level for Me? 2018 Ford F-150: Which Trim Level is Best for Me? When you’re looking at a mid-size SUV purchase, the 2018 Ford Edge has been a top consideration. There’s nothing quite like it on the market today. It has unique style and comfort, and has the versatility you’ve come to expect in Ford SUVs. Under 2018 Ford Edge SE’s hood, you’ll find a 2.0-liter Twin Scroll EcoBoost engine with Auto Start-Stop Technology. Front-wheel-drive is standard equipment while Intelligent AWD is available for the SE trim, and it rests on 18-inch aluminum wheels. Intelligent Access with Push-Button Start is standard on all trims, including the entry-level SE. 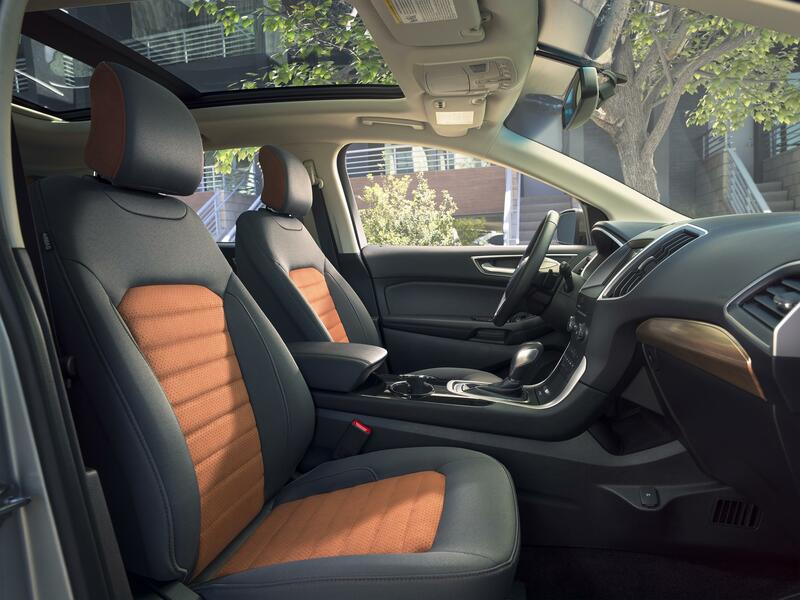 Cruise control, SYNC infotainment, and sport fabric seats are included on all Ford Edge SE models. The 2018 Ford Edge SEL ratchets it up a notch or two. The same 2.0-liter engine is standard, however, there’s an option to select the 3.5-liter Ti-VCT V6 engine instead. Intelligent AWD is also optional, and 18-inch aluminum wheels are standard. Inside, you get dual-zone climate control, a leather-wrapped steering wheel, SYNC, unique cloth-wrapped power front seats, and a second-row EasyFold seat. On the outside, heated exterior mirrors, Reverse Sensing System, and LED signature lighting are standard. The SEL trim has an available Sport Appearance Package also. It adds dark-accented exterior trim, 19-inch Magnetic Gray wheels, and unique Umber suede cloth and Copper Dune interior accents. The powertrain options for the Ford Edge Titanium remain the same as the SEL trim. In addition, Adaptive Steering and 20-inch wheels are options and 19-inch wheels are included. Ambient lighting, a hands-free foot-activated liftgate, and SYNC 3 with a 12-speaker Sony audio system are standard equipment. Illuminated door sills, memory mirrors, and heated leather-trimmed front seats are found across the Titanium trim level. For the most fun you can have in a Ford Edge, choose the Sport trim. It’s powered by a 2.7-liter EcoBoost V6 engine and comes standard with Intelligent AWD for guaranteed traction. 20-inch wheels are the norm while 21-inch wheels are available as well. You get aluminum pedal covers for the sporty feel, leather-trimmed and suede upholstery, Piano-black grille and gray surround, unique headlight looks, a distinct lower fascia, and much more. 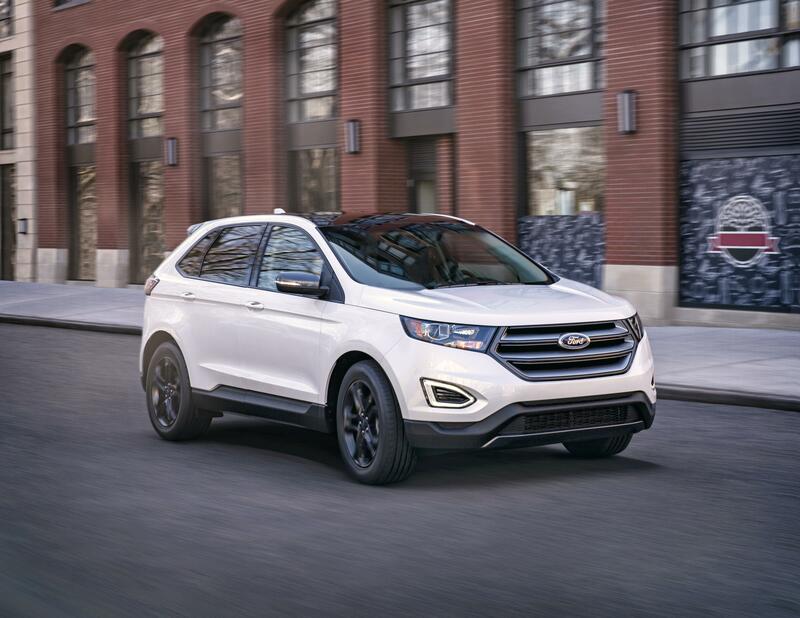 On the Titanium and Sport-grade Ford Edge, an available Technology Package adds amazing features. They include voice-activated Touchscreen Navigation, heated and ventilated front leather seats, and Remote Start System. These features make the ride so enjoyable. Ford’s Panoramic Vista Roof is also available on these trims. Safety is a priority on all Edge models, but the Safe and Smart Package takes it to new heights. Adaptive Cruise Control with Forward Collision Warning and Brake Support, Auto High Beams, Blind Spot Information System, Lane Keeping System, and rain-sensing wipers are all part of this safety-centric group. Choose from a well-equipped Ford Edge SE or a top-tier midsize SUV like the Ford Edge Titanium. You’ll be completely satisfied with your choice. You’ll find the 2018 Ford Edge and other Ford SUVs at your local Southern California Ford dealers.